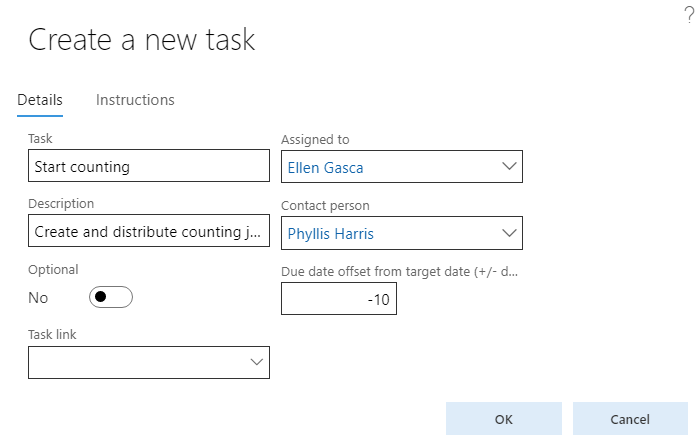 Moving data from one company to another has been pretty taxing ever since we suddenly were faced with the missing “Duplicate” feature when first diving into Dynamics AX 2012. For a while, we’ve been using the Data import export framework (DIEF) to export entities and import them back into other companies. 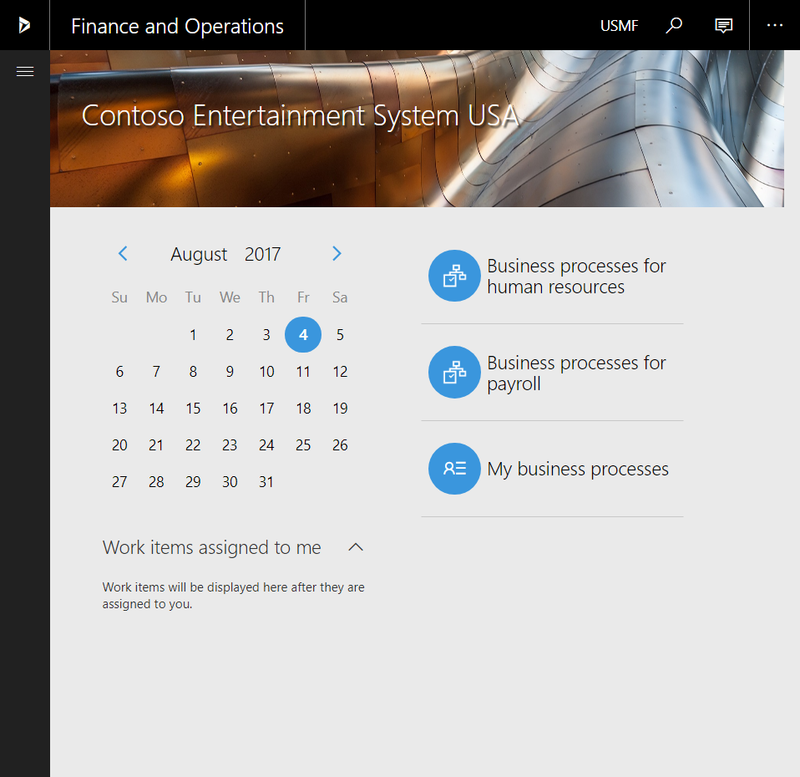 That worked fairly good, but now with the Microsoft Dynamics 365 for Finance and Operations, Enterprise edition Platform update 11 we have a solution for copying directly between legal entities within a solution. I tried the concept out on a very superficial setup as there are A LOT of parameters and entities to configure and stack in the right order. I haven’t been able to do a full implementation of it to test it out in a proper scenario, but at least the concepts are looking to be working. It can be used for copying a company to another and starting with a fresh sheet as well as making a form of virtual data exchange. This solution can be set up to work both ways. Go to the Data Management Workspace. Select the “Copy into legal entity”. Select a source legal entity and the target legal entities. Yes, you can copy to MULTIPLE companies from one legal entity. Add the desired entities either multiple or one by one. The big job is now to re-arrange the different entities so that the dependent ones are read in first. You can create Execution units and levels within these and then do a resequencing. I didn’t do that in this case and did run into some dependencies afterward, but it didn’t really matter for my exploration. I would also guess that this will be things that can be copied in or templated, as there is a template option (maybe in LCS). There would probably be something that someone would make and share once it is first done. After this setup, I ran the import. …with some errors and dependencies that were missing. So I looked at the staging data and quickly found that I was missing an entity. I added it and ran it again. That did it. A successful copy of data from one legal entity DIRECTLY to another. Lovely! 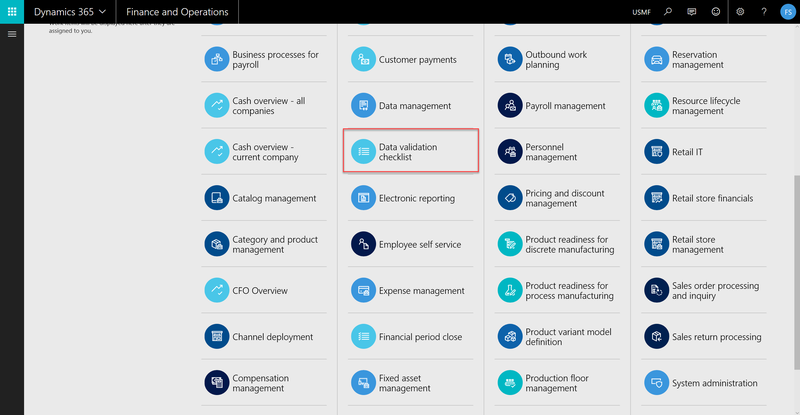 In the latest release of Dynamics 365 for Finance and Operations, Enterprise Edition there is now a check list feature for creating new setup in the system. 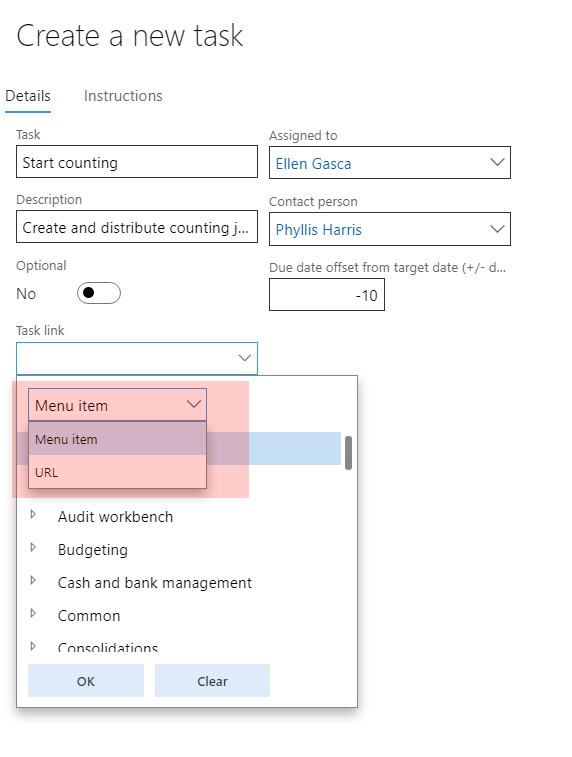 It lets you enter a set of tasks within a configuration area and attach a menu item link for each task. Then you select the companies that this falls under and the task is then duplicated for each company and you can select the performing user for each particular company task. I noticed the feature as it has its own Workspace and it isn’t to hard to understand, so let me run you through it real quick. Opening up the workspace you’re faced with a page which shows you a task overview for a given DVC project. If you tick the Project dropdown in the Contoso demo database there is already a project present which clearly shows the intent of the solution, but I’ll create one from scratch to run you through it. You create a new and can copy from an existing project and select what data you want copied. 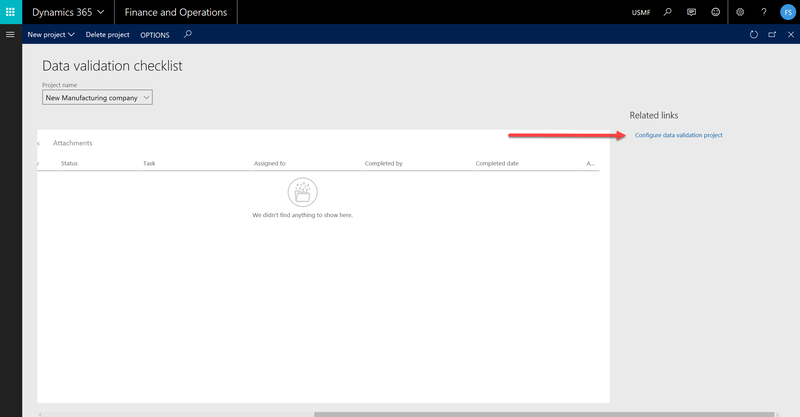 Scroll all the way to the right in the workspace and click the “Configure data validation project” link in the “Related links”. First create the Task Areas you need. Note that the Task Areas are global and shared between all projects. You can create multiple areas for different processes, but all will appear in this list eventually. 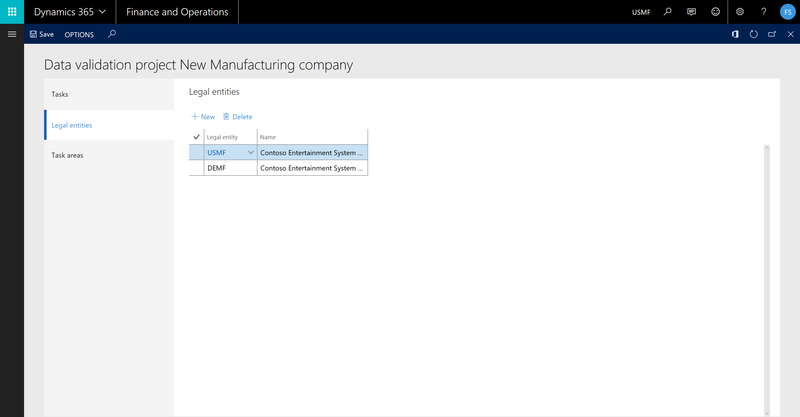 Select the required legal entities you want to configure. You can do this later also. 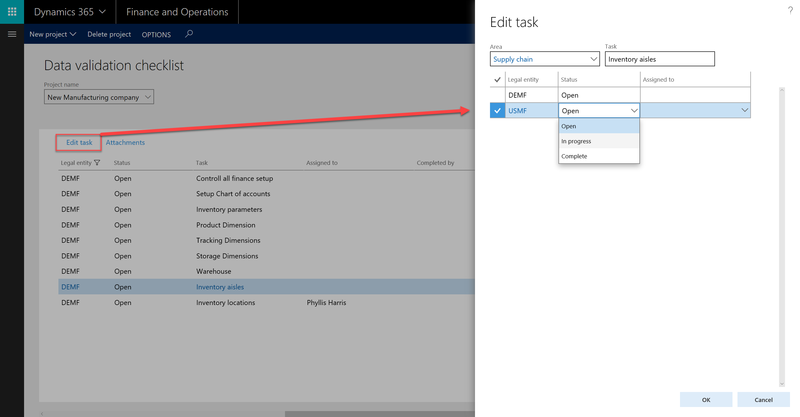 Add a task description, then a task area and select your menu item from the drop down tree. 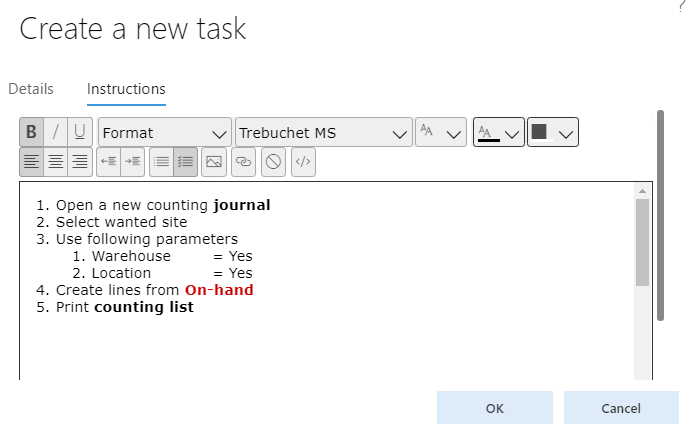 The display order will let you reorganize your tasks afterwards. You can have as many numbers as you want (pretty much). It will sort numerically, so 20 comes before 100. If you want to have a 2, 20, 200 type hierarchy… It won’t work. 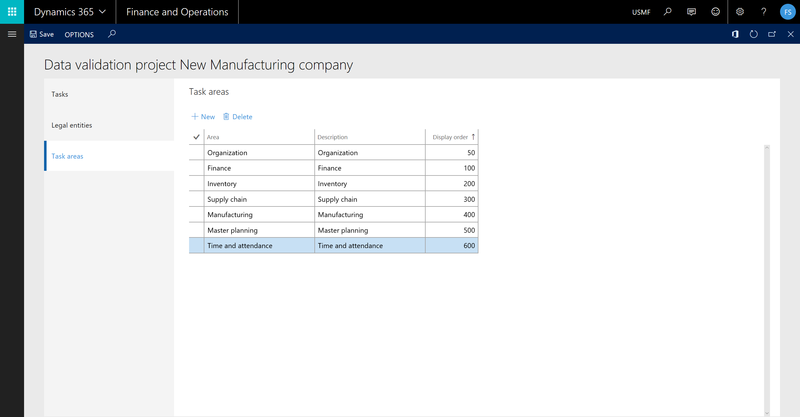 You can add attachments for each company task. This is great for spreadsheets of data or other type of documents that shows what data to control against. Just click the Attachments action menu item. Once attached the binder icon will show up (green arrow). You can add any type of attachement that is defined in the document type settings. Just click new and add it. That basically covers the setup. Using the feature as an end user isn’t all that intuitive. I would love to see these tasks be created as other general tasks in the system and the user can work with them as any other task. I couldn’t find out how, so if you do… please let me know. You would have to go to the task and click “Edit Task”. That opens up a dialogue box where you can select a individual company task (even if it already had that context from the table) and set a new status on it. You can select an “Assigned to” person when doing this if it is not already assigned. 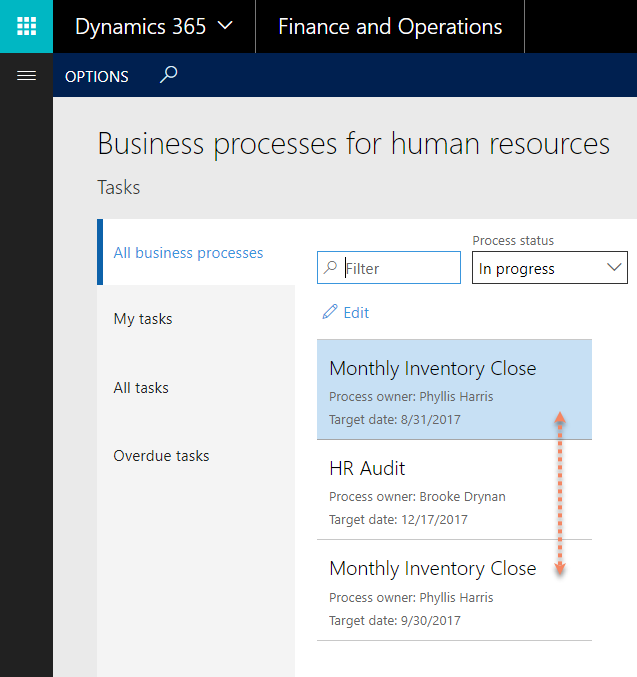 After changing the status to “In progress” for the company you would click the task name. This will open the assigned menu item and the person can perform the work. After completing the task the person can either assign a new person for control purposes or close the task. The same procedure as before will be used and select “Completed”. The overview screen will update with the completed and in progress statuses and you’ll have a nice overview of the progression. I think this is an awesome feature that is pretty handy to have on board and I believe that it will be improved slightly over time to be more user friendly. 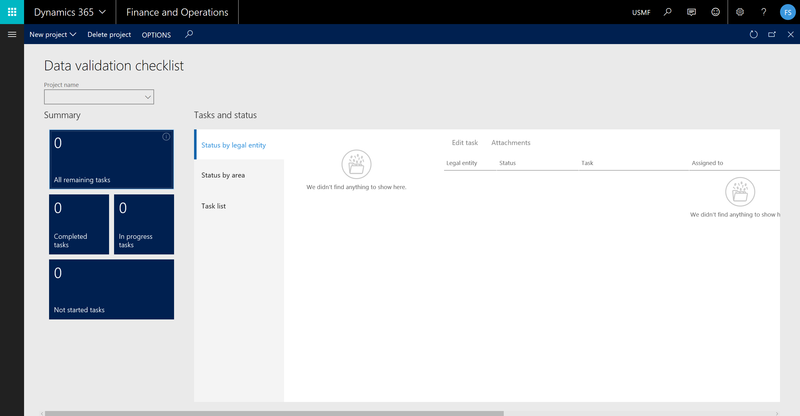 I’m hoping for a “my tasks” view, but you could of cause create that yourself. Have a super time setting up that new company! Going to a conference might look like a costly affair with attendance, travel and hotel expenses as well as being away from work with other covering the work load and missed opportunities. However in n my experience it is what you make of it yourself. Sending someone that is hungry for information and is willing to strike up a conversation with a stranger will give you great benefits from joining a conference like Summit. In fact I would argue that it pays of many times over if you take advantage of the opportunities. The many sessions should give you a lot of new information and inspiration to do more. Speakers will most likely have Q&A and hope you will interact with them. They also remain after their sessions so you can ask them one to one or give you their contact information, so you can get in contact with them after the conference. Use them! They want to help. Summit has a bunch of other interaction events like round tables and let’s you hook up with other customers or partners for a talk through their portals or through different chapters. I know that Mike Ehrenberg and the rest of the executives had many sessions with customers to get direct feedback. That is a MAJOR opportunity to directly influence the direction of the product. The MVPs that where stationed at the Medics desk and we didn’t really see that much traffic, but for those who came to have their questions answered got good help. I had a very nice lady that came back day after day, going back to her co-workers each day for more questions that needed answering and returning for a new round. Many of the implementation partners and most larger ISVs have social events with their customers and other partners. This is a great way to tie closer bonds with them and talk about the products. 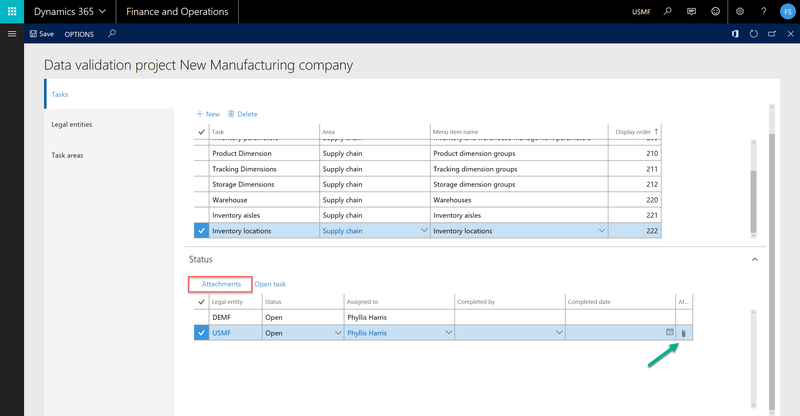 I observed one customer get half an hour with one of the Microsoft program managers to get the very best answers to future strategies on warehouse management implementations for the business. That is some great value and probably covered the travel in itself. Also the bar at the hotel (if you selected one of the hotels suggested by the event) will probably let you get in contact with some other attendees in a social setting. Use time to join the sessions you find interesting, but also find time to roam the ISV booths. Interact with other attendees, strike up a chat and exchange business cards. Join the user group events and get to know other partners and users by being social and open to meet new people. You’ll get your moneys worth! Make a suggestion and get heard! 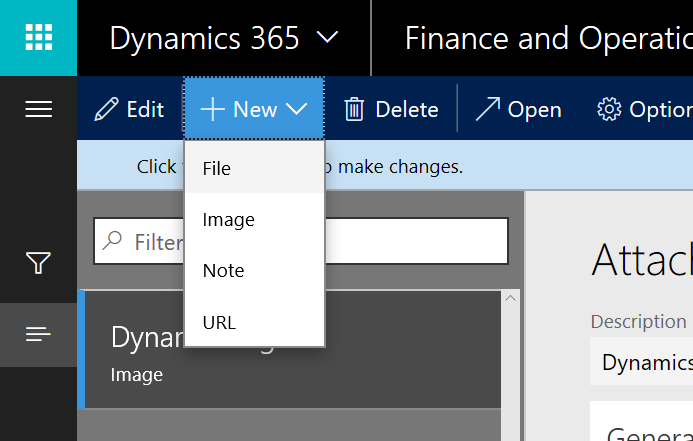 If you have a suggestion for improvement or changes for Dynamics you can go to the new Ideas page and get to know the solution better. You can also go here to browse suggestions and vote them up to get the improvements that are important to YOU up on the agenda. This is a preliminary work list that actually makes it to the product. So go get your voice heard and make the application move in your direction. The awesomeness of the HTML5 client is apparent, but it might be even clearer if you know a bit on how the URL parameters work as well. These can be used to further enhance your user experience and extend the usage of the web client. You can set a default company that the user defaults to at User Options > Preferences > Startup > Company. Use this URL parameter to override this and directly access a legal entity. 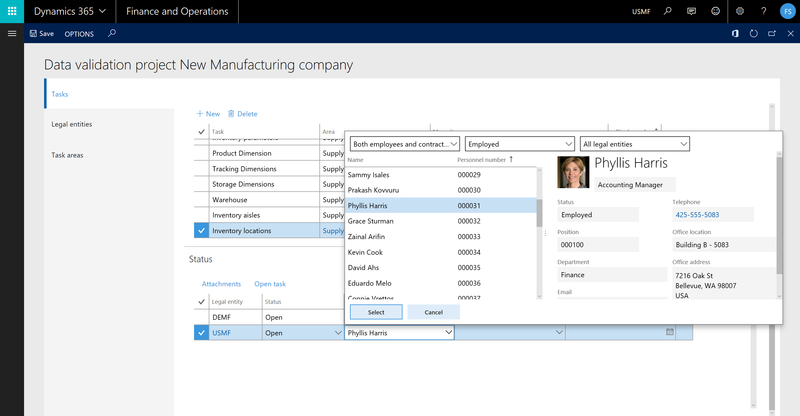 If you use many companies it will be easy to create shortcuts for each company for quick access. Note: This parameter is visualized by default in the URL. You can set a default user language under User Options > Preferences > Language and country/region preferences > Language. However if you like to open the solution in another language, use this URL parameter. Great if you’re doing user training and support, work with different companies in their native languages or if you are doing a demo. Note: This parameter is visualized by default in the URL and it is easy to copy it for future use. Want to skip the splash screen? Use that. Looks like it shaves of a millisecond or two, so it isn’t that much faster. It does however look slightly cleaner from my standpoint. The theme ID is the number of the color palette given in the user setup. This is awesome when combined with the “cmp” URL parameter. Gives you a sense of what company you’ve launched, but be aware that you can change company at any time. If you’re afraid you might accidentally navigate to a form you shouldn’t be in, you can use the “limitednav” URL parameter to minimize this risk. This parameter takes all navigation possibilities away. Working on both tablet and on a computer? There are two different types of grid density in the solution. High(21) and low(30). Select your pixel density by using this URL parameter. This is the same as selecting a different grid density in the user options. Example: &density=21 is best suited for desktop and &density=30 is best suited for tablet/touch. If you have a solution that is partitioned you can use this to quickly going to the right one. The feature is deprecated, but still works. For instance the Contoso database Public sector partition can be accessed by writing: prt=ps. You can get an overview of the partition by entering f=PartitionAdministration (replacing the mi parameter). Note that partitions have their own user access, so you would initially access it with the system master user. Thanks to Ievgen for pointing this out. Some forms doesn’t have menu items. Like “SysTableBrowser” *, “jmgClock”, “WHSWorkExecute” and “jmgWorkPlanner”. These are some forms that are in the system, but isn’t accessible through the menus. This replaces the “mi” parameter. If you activate the “URL manipulation” parameter under your User settings > Preferences, you’ll find that when doing a filter or record lookup you’ll get a query string directly in your URL. I assume that this is the query string that is created by the deep links generator. This is described in the Operations Wiki. The mode selector does access features that you might otherwise not have access to. The “trial” attribute starts a trial experience and the “mobile” attribute gives the user access to the mobile application builder feature. This gives you the opportunity to debug the application directly in the web client. It gives you a little indicator right next to the legal entity (company) selector on the top menu bar and clicking it gives you details on the client performance. That is the list so far. This will give to the opportunity to create direct access to the form and information you need quickly and give a better user experience. I can see great benefit in a multi company solutions. What URL parameters do you know about that isn’t on this list? A panel full of Microsoft Business Solutions MVPs today. André Arnaud de Calavon and Sohaib Cheema joins us to talk about the importance of knowing security basics. 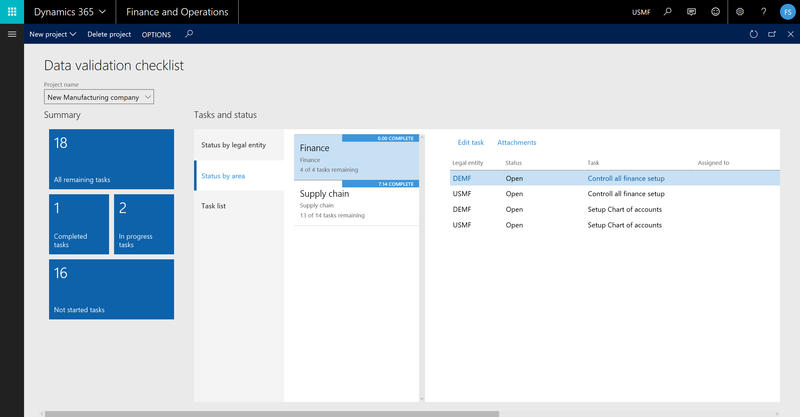 We get in to some deep dive discussions into the in details and issues with managing security and licensing both for Dynamics 365 for Operations and Dynamics AX 2012. Thank you to AXDATA for making this possible. I noticed that the global navigation features are implemented WAY better in Update 4 then earlier versions. If you click the “waffle” (3×3 dot grid) in the top left corner in Update 4, you get the Office 365 apps dialogue instead of opening a new pane with Office 365.